MELINDA: Good morning, Michelle! It’s been a while since we got together to talk about manga, but we’re certainly going to make up for it this week! MICHELLE: Indeed we are! I’m excited that the e-publication of older shoujo titles on VIZManga gives us the opportunity to have columns like this one, in which we’re basically gonna check back in with a couple of series we previously discussed and see how they’re faring. MELINDA: I second your excitement, that’s certain! 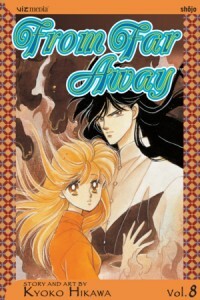 Back in March, we took at look at the beginnings of two shoujo fantasy series from the 1990s, Chie Shinohara’s Red River, and Kyoko Hikawa’s From Far Away, both currently in digital re-release. Only two volume in, I think we’d both picked a favorite, but I’m interested to see whether things have changed at all on that front, now that we’ve delved in further. Michelle, would you like to get us started? So, as a reminder, Red River is about a modern-day Japanese schoolgirl named Yuri who is transported to the Hittite Empire by the scheming queen, who intends to use Yuri in a curse against the other princes so that the queen’s son may ascend to the throne. Very quickly she meets Prince Kail and becomes known as his concubine. 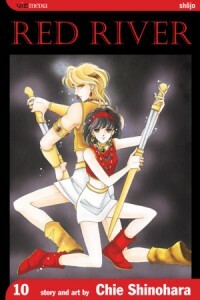 As the story develops, Yuri is eventually hailed as the incarnation of Ishtar, goddess of war. At first, Kail just makes this up in order to have an excuse to keep Yuri with him when he rides off to war, but there are a few suggestions in the story that this might actually be true. The queen cooks up a variety of schemes designed to get rid of Kail and/or Yuri, and so our heroes spend most of their time trying to foil her plots, but have a hard time proving she was ultimately responsible for them. Meanwhile, their romantic feelings for each other grow, but Kail holds back because he believes Yuri really wants to go home, and Yuri holds back because she believes that Kail is going to have to marry a suitable queen someday and that he can never really be hers. MELINDA: I will be the first to admit that, though I liked Red River from the start, I was less than enthused about its general plotting and its romantic trajectory and certainly held it in somewhat lower regard that I did From Far Away. Now, ten volumes in, things have changed dramatically, at least as far as Red River is concerned. It’s hard to believe now that I was once dismayed by what felt like too-easy plotting and wearied by Kail’s “rake” persona, as I’ve been swept up completely by both at this point. And I think that Yuri’s characterization deserves credit for both of these things, as it’s her strength and general awesomeness that makes the whole story work for me. She’s transformed from simply “plucky” to “thoughtful and inspiring,” and she’s transformed those who remain near her, including Kail. Another aspect of the story that’s developed a lot is the political scheming. I also really like Ilbani, who is Kail’s… chief-of-staff or something. He originally counseled Kail against marrying a mere concubine, but once he saw how great Yuri would be as queen, he changed his tune, and has actually been conspiring to keep her from returning home to Japan. MELINDA: I think maybe the political scheming has had a lot to do with my change of heart on the plotting as well, because it keeps the story’s very black-and-white villainess (formerly the queen, now the dowager) from becoming too one-note to be interesting. Yes, she’s only got one real objective—increasing her power by making her son king—but there are a lot of obstacles in her way, and her path isn’t simple by any means. Also, her son is a truly lovely character who, though too young to be an effective king, is at least no Joffery Baratheon. That’s a nice touch. I have to say, though, that Yuri has never gotten “on my nerves.” I genuinely adore her, and that feeling is only increasing as the story continues. But perhaps my perspective is a little different than yours, because I admit that when you said that she’s become a genuine asset to Kail, I was thinking, “No, it’s that Kail has become a genuine asset to her!” Heh. I especially appreciate the fact that she’s adjusted to her environment enough to understand, from a cultural standpoint, how the results of her actions in this world would differ from those in her old world, and tries hard to make adjustments with that in mind. And her decisions during the Hittites’ war against the Mitanni really show her true colors. Her heart and her bravery ring true even when she’s being handed some unbelievable abilities, and that’s ultimately what’s important to me. MICHELLE: I suppose the reason why I phrased it that way is because Kail has some clearly defined goals as to what he’s trying to accomplish long-term, and Yuri doesn’t. That said, she does take on and successfully complete various short-term projects, and having his backing is indeed an asset there. And I do assume that she will eventually develop long-term goals of her own. One random thing I wanted to mention is… isn’t Kail supposed to be some awesome sorcerer? He’s got the capability to send Yuri home again, but we never see him work any magic! You’d think he’d be able to devise something to actually catch the queen in the act! MELINDA: You know, I admit I hadn’t really thought about it! In a way, though, I’m glad he hasn’t been performing any sorcery, because I feel like that would be just another checkmark on the list of “things that are too easy in Red River,” and watching him deal with things with only the power of politics and personal strategy is much more compelling. After all this time, I think I’d just sort of assumed that he can help Yuri get back because of the magical power in the particular time and place rather than because of his awesome personal power. And maybe I’m not so far off, really. Even the queen is limited to what she can do with what’s at hand. She can create a potion with mind-controlling properties, but it’s not like she can wave her arms and make someone into her slave or turn them into a goat or something. I think the limited magic makes the story work a whole lot better, even if it means sloppiness in other plotting areas. MELINDA: You speak the truth. As always. MICHELLE: Heh. So, want to catch us up a bit on From Far Away? Like Red River, From Far Away sends a Japanese high school student on an epic journey, but one through space/dimension rather than time. Noriko’s increasingly strange dreams become reality, as a seemingly random act of terror plunges her into another world in which she is identified as “The Awakening,” a supernatural being prophesied to bring forth the Sky Demon—a legendary evil that grants ultimate power to any nation that controls it. True to prophesy, Noriko’s first encounter is with a warrior named Izark, who is soon revealed to be the yet unawakened Sky Demon. Aware of his destructive potential, Izark’s original intention is to destroy The Awakening before it can transform him into the monster he’s sure to become, but as he gets to know Norkio, he finds himself unable to do so, and decides instead to distance himself from her, in hopes that this will be enough to keep tragedy at bay. But prophecy being what it is, even this is too much to hope for, and he finds himself drawn back to Noriko despite himself. Further in (we’ve both now read through volume 8), the two, now deeply in love, have finally become resigned to their mutual plight, and have decided to travel together, hoping against hope that they can somehow alter their fate. MICHELLE: I have to say that From Far Away started off as my favorite of the pair and remains that way. I have a very strong compulsion to compare the series, but probably I should give FFA some praise on its own merits first. I love the real adventure feeling of From Far Away. By this I don’t mean the various monsters the characters encounter, or the strange beasts, or the political scheming (yes, there’s a bit of that here, as well), or Izark’s supernatural powers. More, I mean the assembly of a hodge-podge group of friends who are traveling together in pursuit of a big, epic goal. In volume three, Izark leaves Noriko in the care of Gaya, someone he befriended two years ago and trusts. It’s revealed later in a bonus story that she was the one who taught Izark to use a sword, and I absolutely LOVE that a plump, unattractive, middle-aged woman gets to be such an unabashed heroic badass. Later, Noriko meets Agol and Geena, a former mercenary and his seven-year-old daughter, whilst Izark initially fights against and later recruits Barago, a hard-faced warrior who soon grows ashamed of his service to a corrupt lord and decides to make amends by aiding Izark. There are some other supporting characters, too, but these are the ones who particularly stand out for me. In fact, I totally ship Gaya and Barago—Baragaya!—and was kinda dismayed to see on an age chart that he is supposed to be 25 (he looks 45!) and she’s 53. Still, I’m sure that those crazy kids can make it work! Anyway, by this point in the story, Noriko and Izark have been outed and have distanced themselves from their friends in order to not bring harm upon them. But it’s not like their friends are now lost and aimless—they’re going to be working to find a lot of honorable leaders that have been ousted by corrupt ones in hopes of eventual overthrow. I’ve got more to say about Noriko and Izark’s relationship, too, but perhaps I should pause here, as this was possibly sufficient gushing. MELINDA: From Far Away is still my favorite as well, and I think what I particularly love about it (besides the things you already mentioned) is that we aren’t left long in that Twilight-esque “I love you but I can’t be with you” place. Though both Izark and Noriko must individually confront the ramifications of their relationship and they struggle with that in their own ways, they ultimately decide that they are better off together than apart, even if it creates a greater danger in their lives and in the world as a whole. Yes, Izark goes through a phase where he’s deliberately standoffish with Noriko (somehow this is always the way), but he gets over it faster than I’ve become accustomed to in the treacherous waters of YA fiction. MICHELLE: Another thing that I really love is our degree of access to Izark’s thoughts. He may have great physical prowess, but we get to see that he’s awkward and anxious, and regards himself as not being strong at all in terms of controlling his emotions. I’m sure I can’t be the only one reminded of Kyo and Tohru here, also. The first time Noriko sees the transformed Izark, she’s not concerned with how he looks, but only sorry that she saw something he didn’t want her to see and worried that he’s going to go away again. It eventually becomes clear that harm befalling her has the capacity to awaken the Sky Demon, but, more than that, she’s the person who can heal his emotional wounds and bring him back to himself. MELINDA: I had, indeed, thought of Kyo and Tohru, and thankfully that’s not a bad thing at all! This moment is expertly written, as well. Though Noriko’s reaction could so easily have played out as an unbelievable mix of selflessness and obliviousness, it truly reads like love, plain and simple. And it makes her role as The Awakening feel all the more important and grounded in emotional truth. MICHELLE: Definitely. And there’s been such lovely buildup to that moment from Izark’s side—”Am I afraid of the day when The Awakening turns me into a real monster? Or do I fear the day when Noriko will see me as a monster and leave me?”—that the significance of what her acceptance means to him is just about palpable. It is no lie that I have geekbumps right now as I type this. I love how he begins to change once he accepts her love, and I love their sense of partnership in this. This does bring up a comparison with Red River, where the threats are generally coming from one source (the queen) and which the audience doesn’t really believe will succeed in killing either of the two leads. In From Far Away, danger is everywhere, and it seems a lot more conceivable (though still probably unlikely) that one of the leads could be forced to do something awful because of who they are. MELINDA: I am in agreement on all points! I really can’t wait to continue with this series (and Red River, too). And I’m sure we’ll take a look at more of these digital re-releases in later columns as well! MICHELLE: I am on a personal mission to get you to read Kaze Hikaru, so yes, I’d say we will! Also, yay for getting farther into From Far Away! I don’t know, I ought to love Red River and I read quite a bit of it, but it never really captured my interest, hmm. I didn’t mean to spurn your link, but it’s the “Warning: Lots of Spoilers” tag that’s keeping me away!